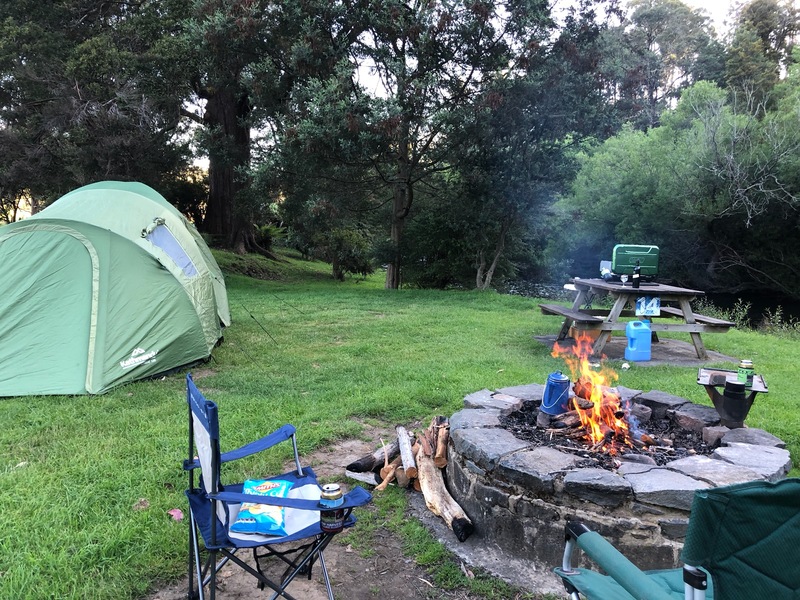 Our first trip to Tasmania for several years and this time we concentrated on the rivers and streams of the North East. 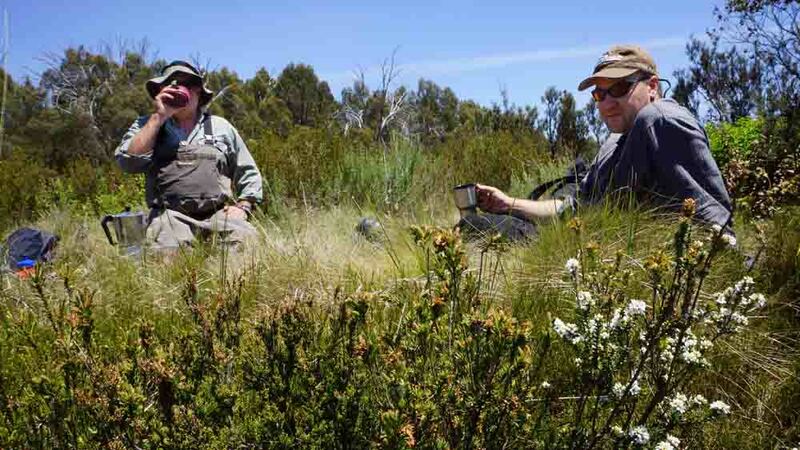 Commencing with the St Patricks and visiting the Great Forrester, Ringarooma and the headwaters of the Nth & Sth Esk. 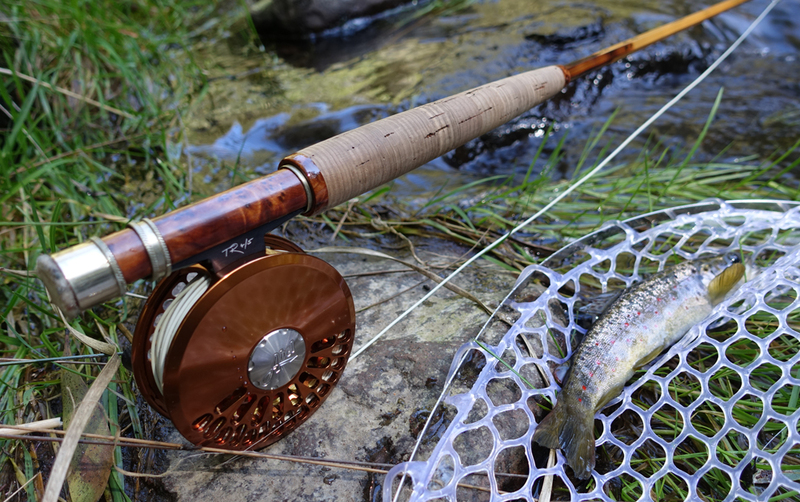 Magnificent forest scenery, beautiful weather and mostly cooperative fish. 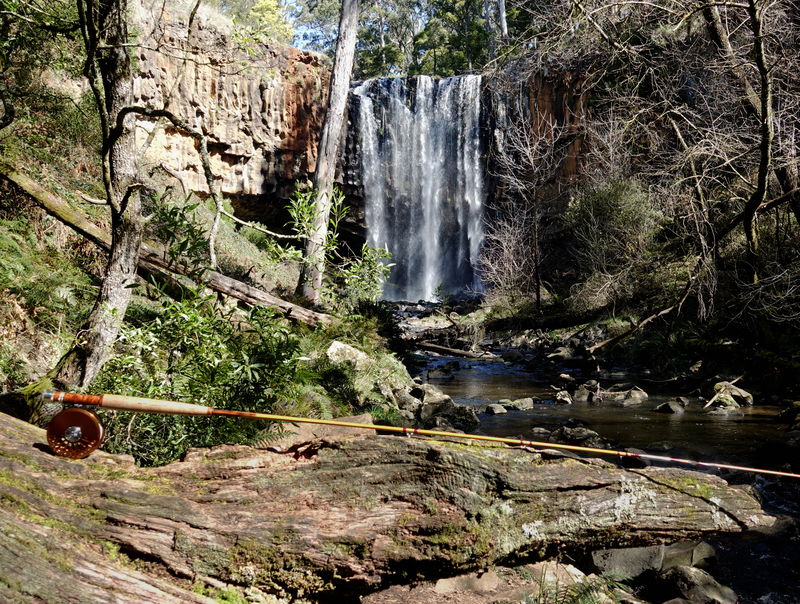 Opening weekend for our new fly fishing stream season included a stopover on the Coliban River in Central Victoria. 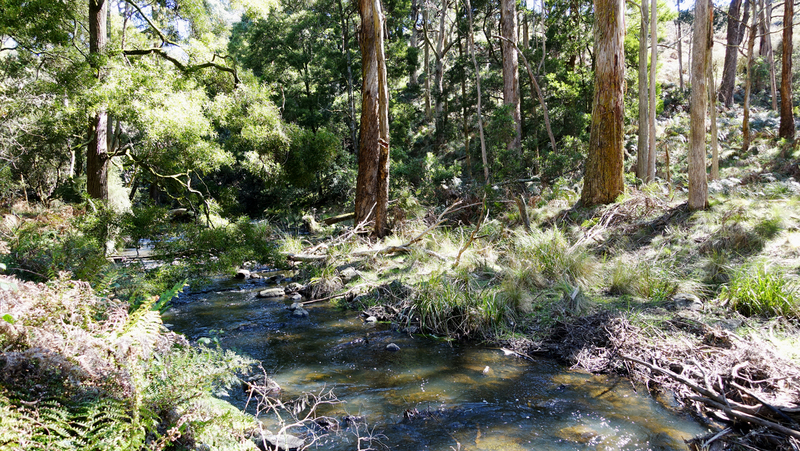 Tight Creek: A small tributary of the upper Swampy Plains River where the surrounding bush almost encloses the creek. 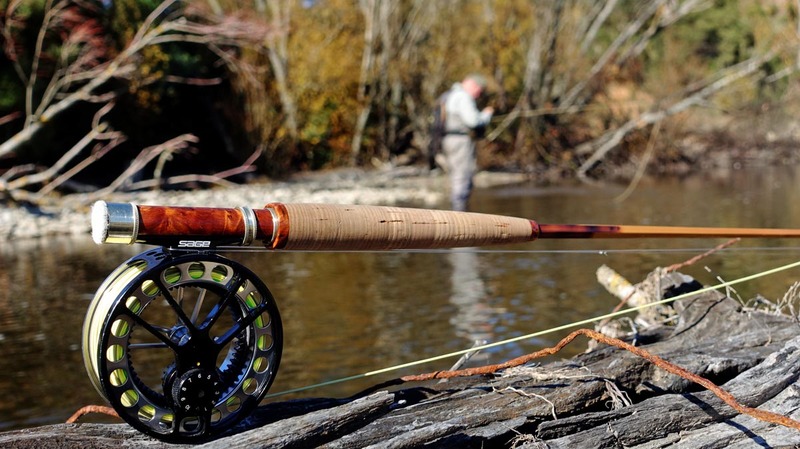 It makes for challenging fly casting where roll casts and short bow and arrow presentations are the norm. 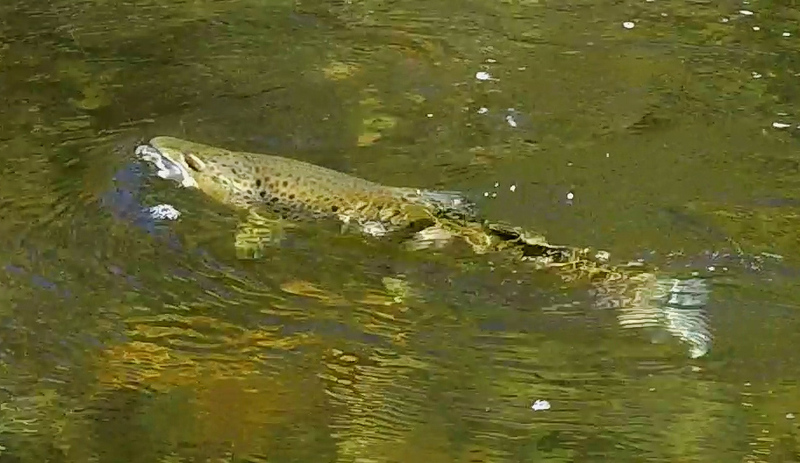 However, if the stimulator lands in the bubbleline of any deeper run it will be quickly engulfed. 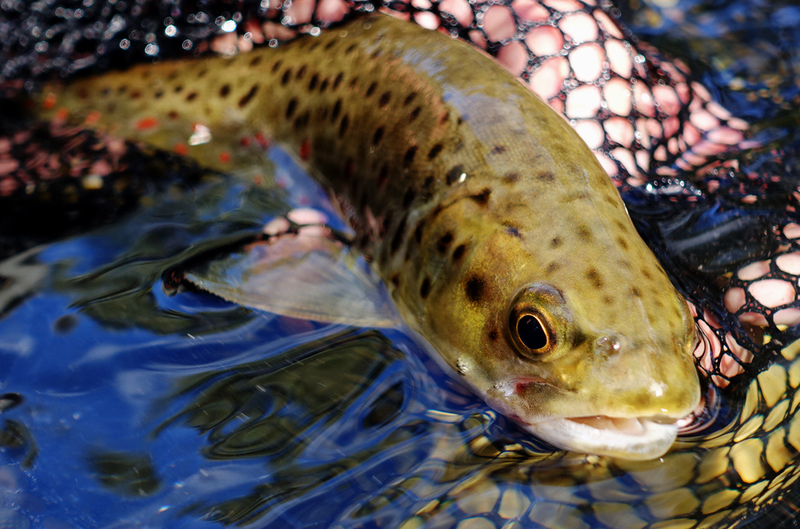 There are a host of small to medium browns andrainbows always willing to rise to a dry fly drifted in the bubble line. With the Swampy Plains River a raging torrent of snow melt water we sought a quieter option for a last few moments before a thunder storm descended upon us from the high mountains. 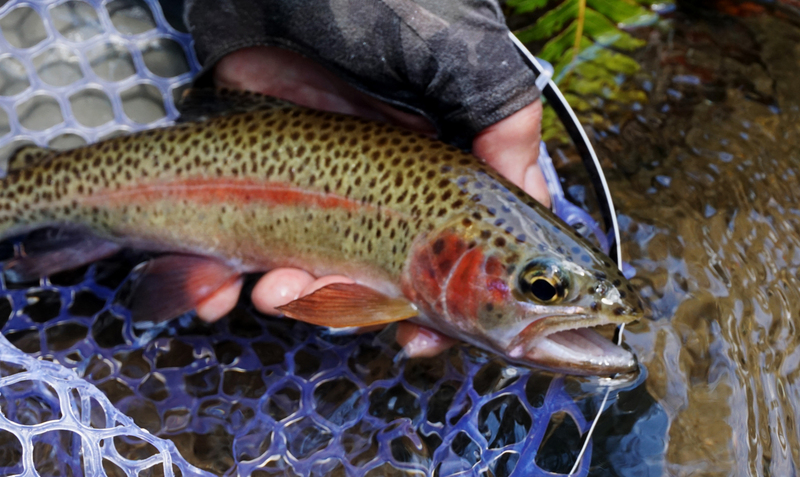 The colourful rainbows gave us great sport in this little tight creek. 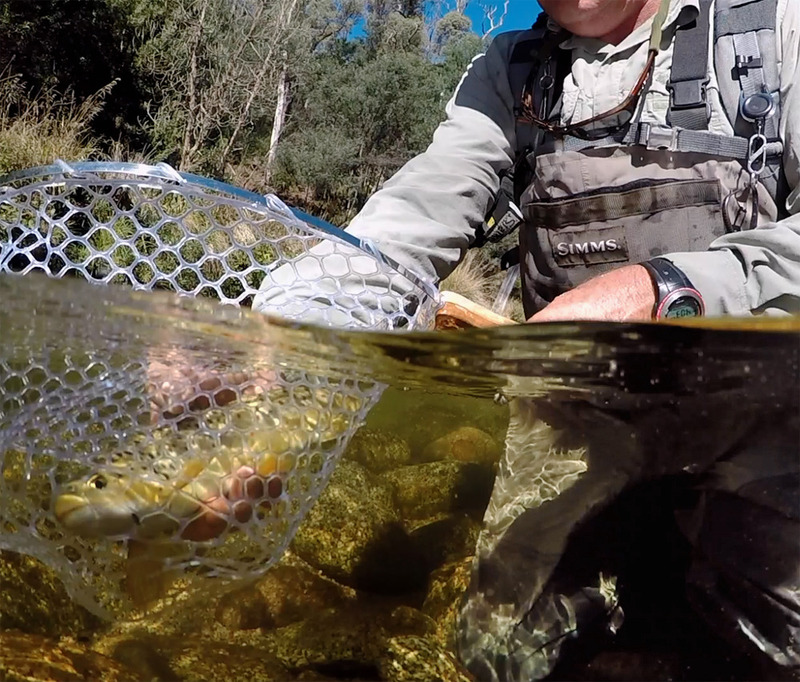 We covered a variety of high country streams in the last week of this years river season. Chris had been busy at his tying vice in preparation for the trip. 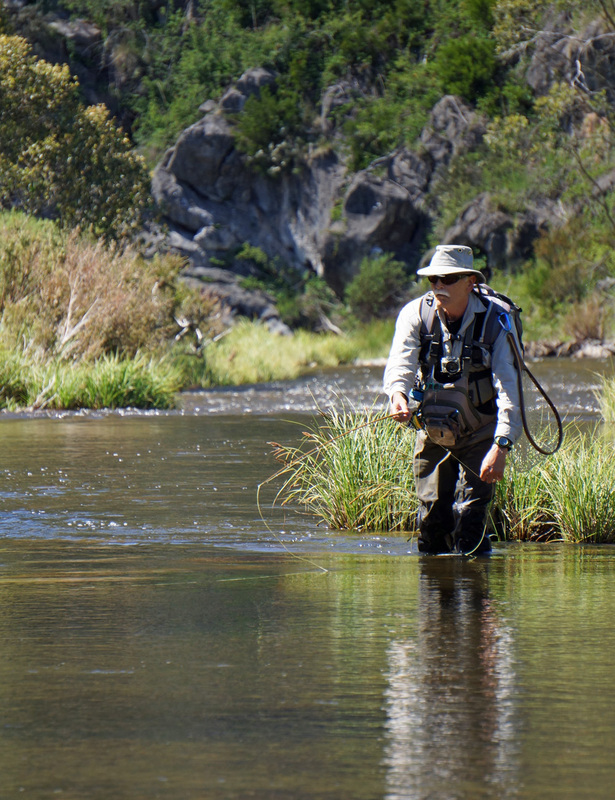 "Ovensdale" is a delightful rental property on the banks of the Ovens River at Harrietville. 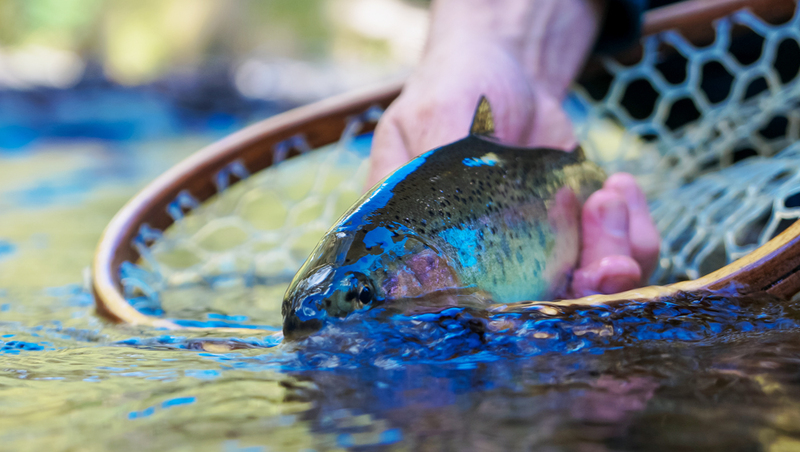 Walking down through the manicured gardens to the riverside to catch wild brown and rainbow trout on a dry fly sounds more like a dream than reality. 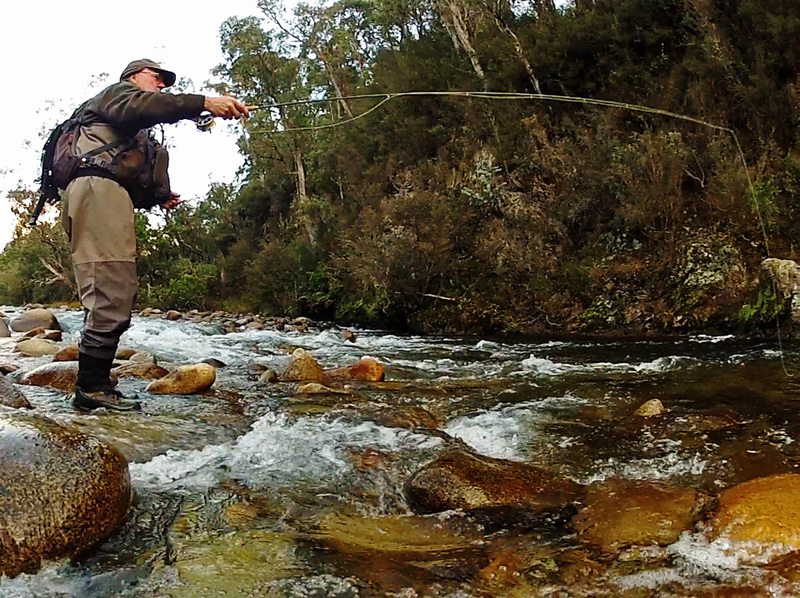 However that's what Ovensdale offers and exactly what we experienced for our autumn visit to the Ovens River. 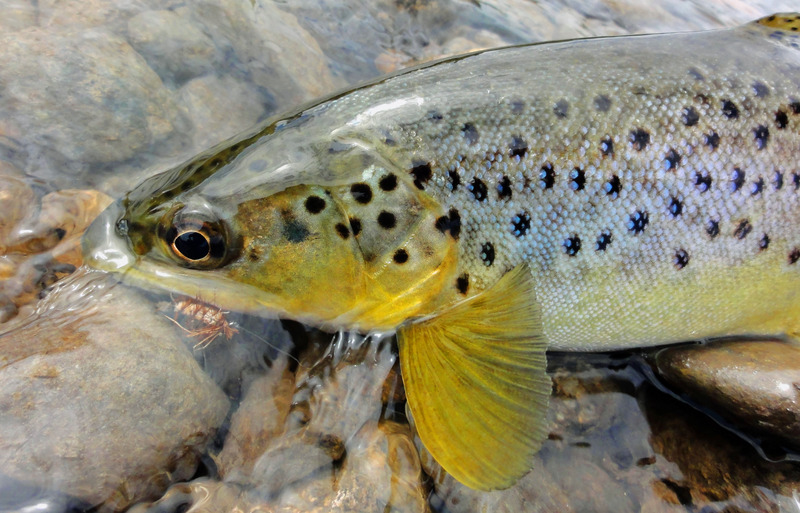 The fish were mostly eager to take dry flies, although some needed to be tempted from their undercut banks by nymphs or wee wets drifted past their noses. 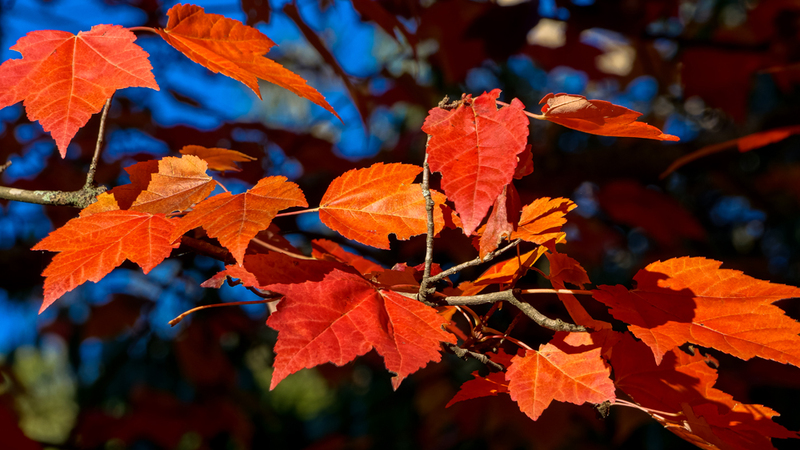 The Ovens again proves to be the ideal autumn destination. 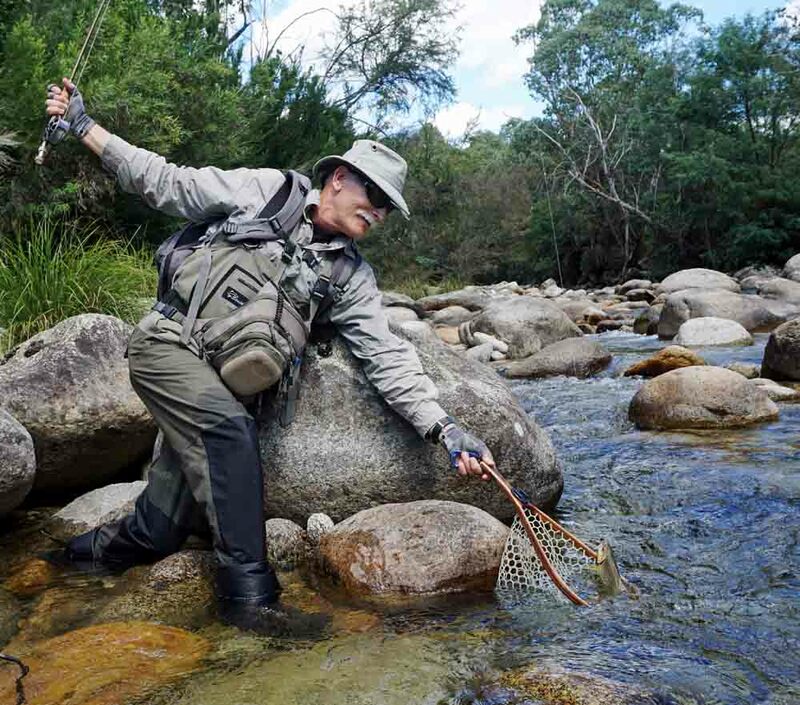 The head waters of snowy mountain rivers provide a particular challenge for the fly fisher prepared to tackle the often long and difficult walks. 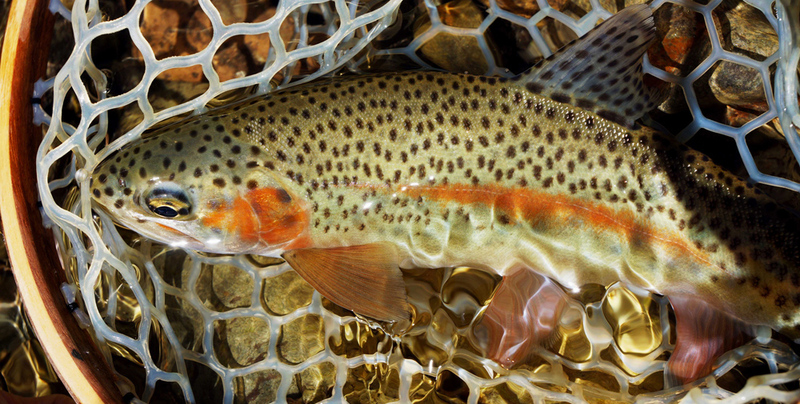 In the deep channels and pools between boulders trout are on constant watch for insects drifted in the bubble lines of this unique pocket water environment. 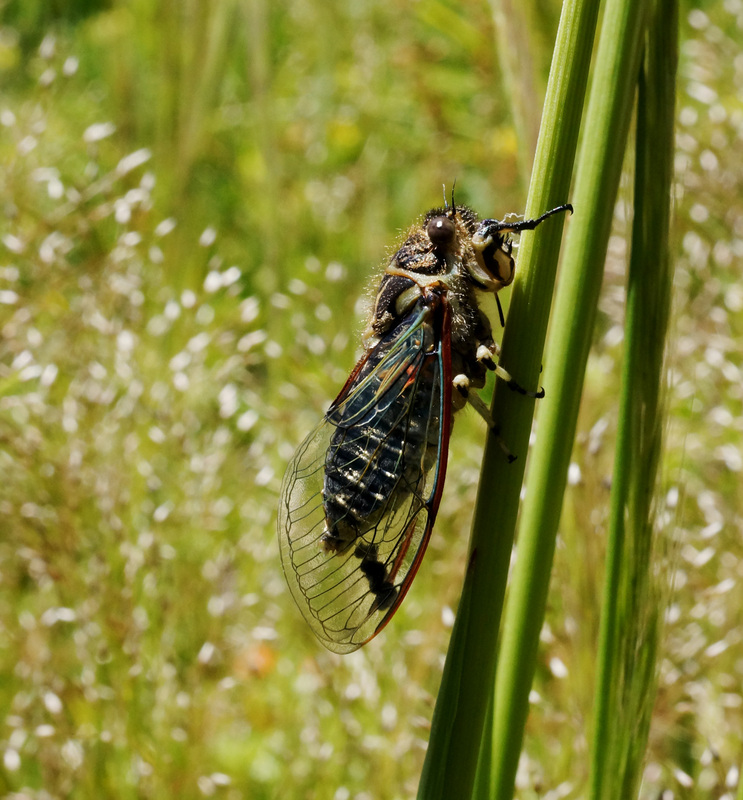 During the height of summer grasshoppers make up a large proportion of the trout diet and it can be an exciting fishing to have large fish emerge from the depths and smash bright yellow patterned grass hopper flies. 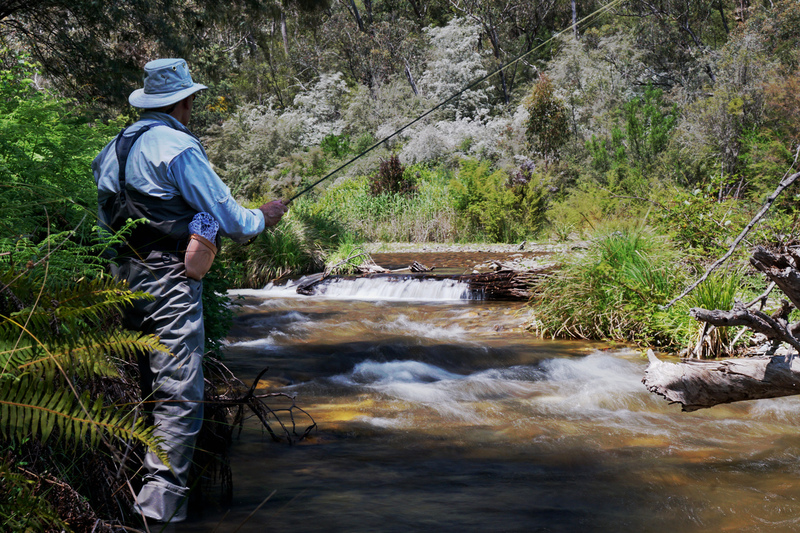 The northern Snowy Mountains offer some ideallic fly fishing, from mountainous boulder strewn rivers to quiet tussock lined creeks. 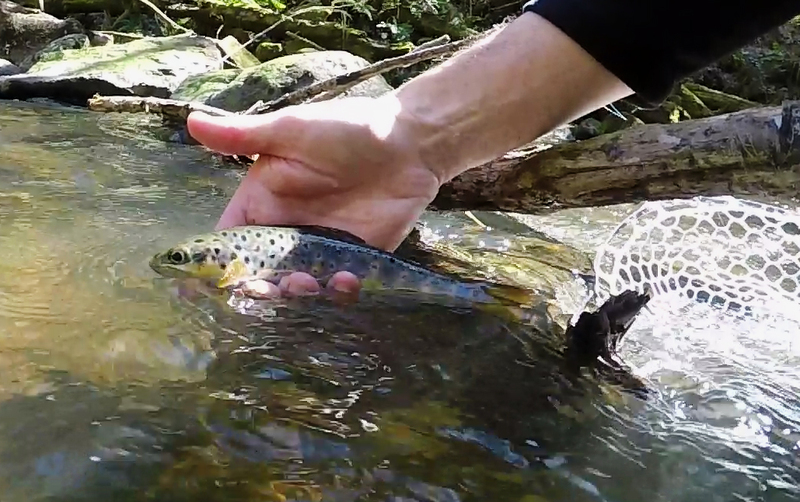 We visited a number of small alpine streams and several larger rivers experiencing near perfect weather conditions and ideal water levels. 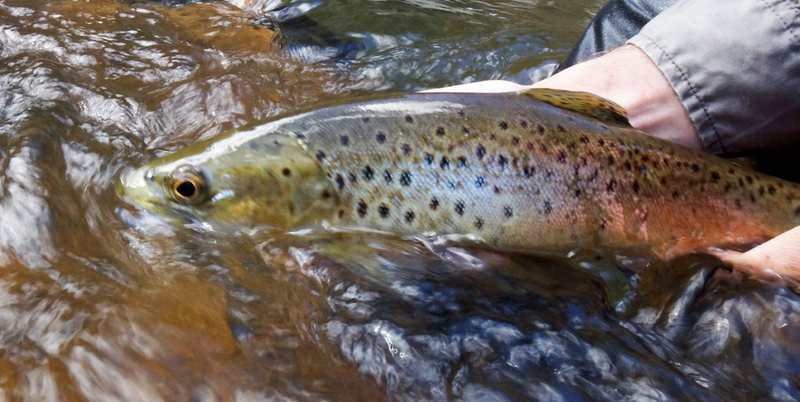 All that was needed was the right fly, the right drift, in the right bubble line and we were frequently rewarded with healthy specimens of resident browns and rainbows. 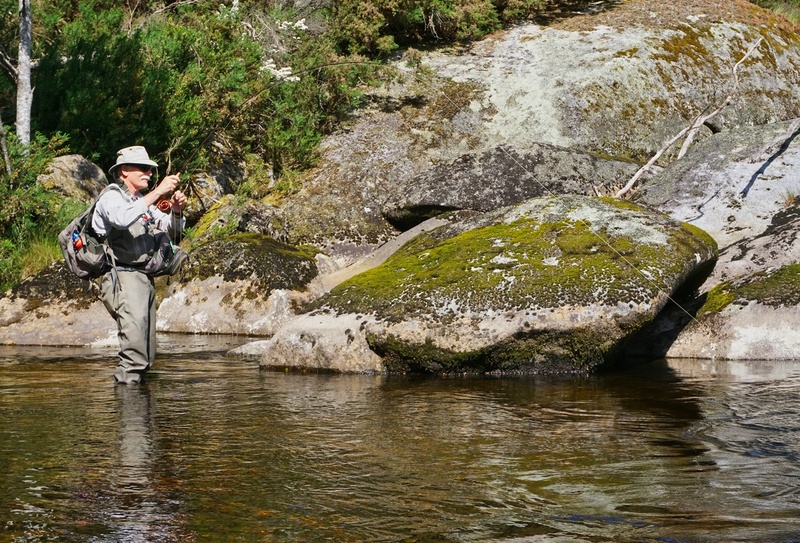 Our nearest flyfishing is found in the streams of the Otway Ranges which fringe the southwestern coastline of Victoria. 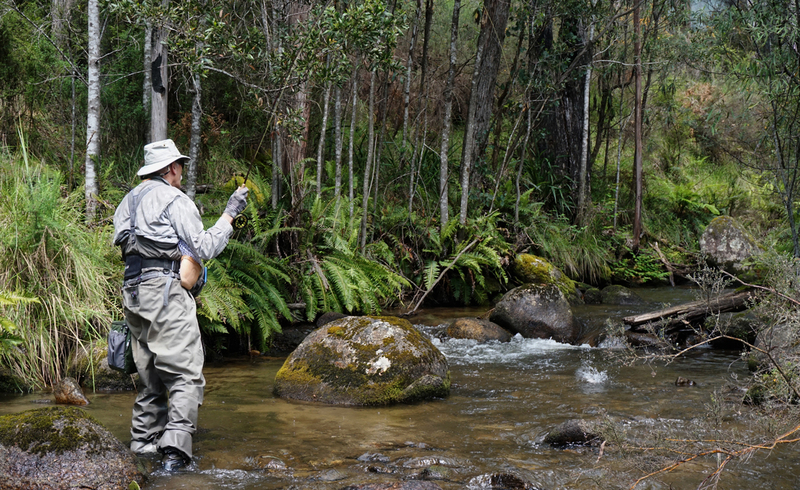 A short drive and we are in the steep rain forested ravines of the Otway ranges and a dozen or more small stream fishing options. 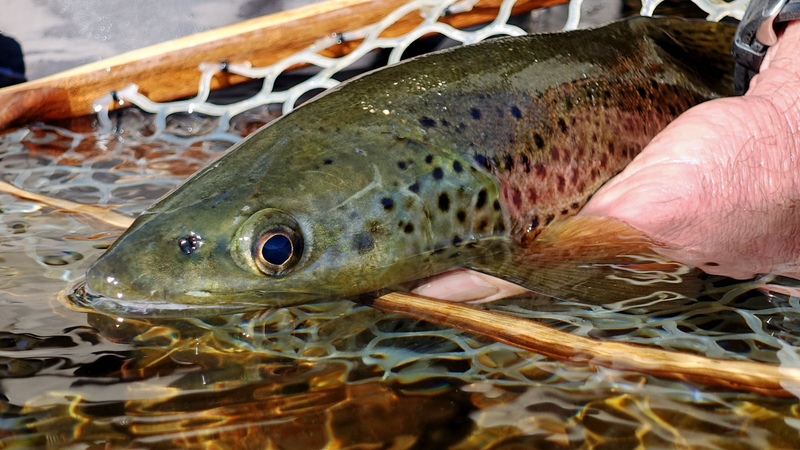 In the headwaters of most streams tall waterfalls tumble into deep well formed pools which provide an all season habitat for the resident brown trout. 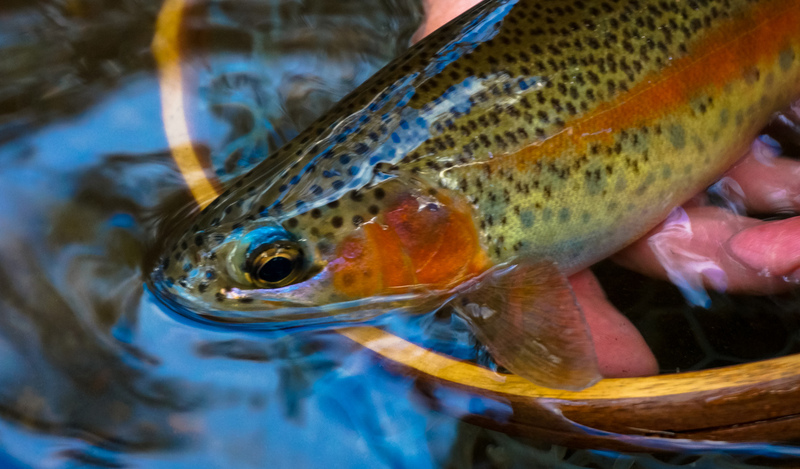 Protected in these pools from regular fishing visitors and the extremes of weather, fish can grow to surprisingly large proportions. 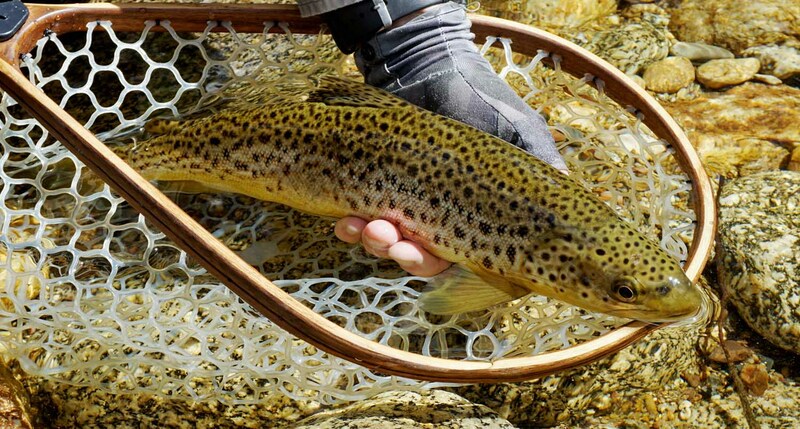 A real challenge for our usual light 2wgt fly fishing tackle. 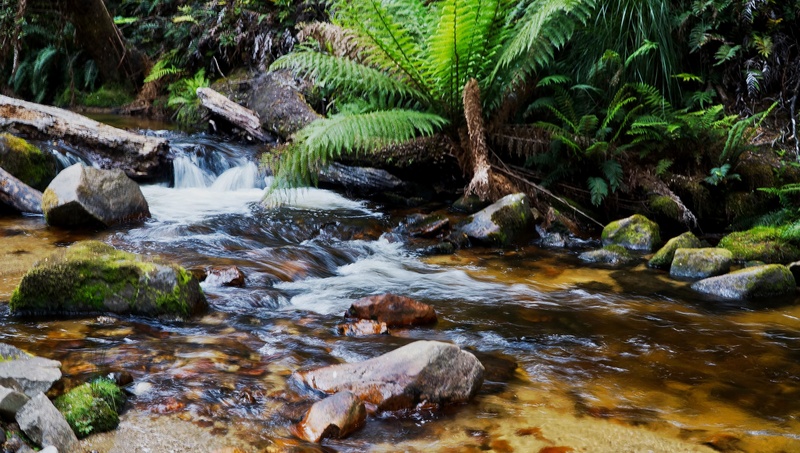 The rugged slopes of the Snowy Mountains provide the source of many rocky mountain rivers. 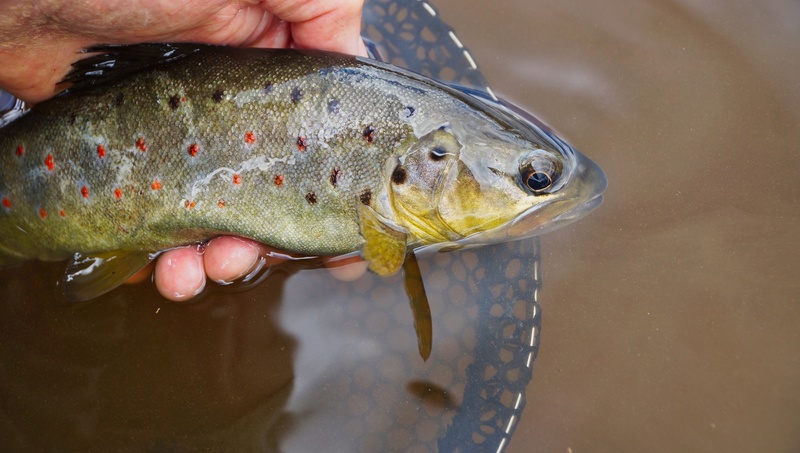 These pocket water streams create the ideal habitat for large brown trout, and ensure a challenge to catch on light weight fly tackle. It’s very much “poke & prod ” water! 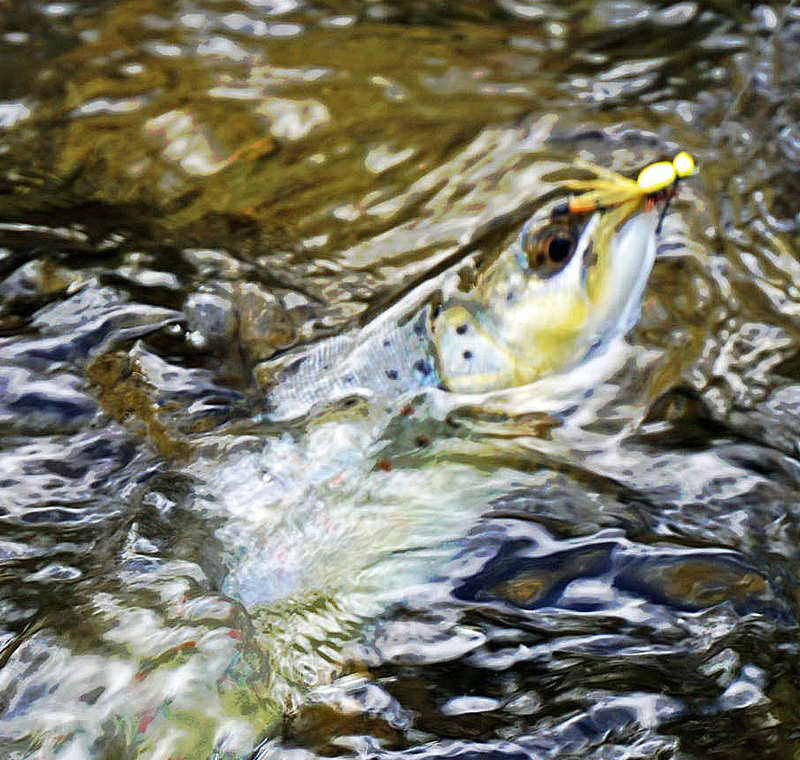 Poke the fly here, prod that bit of water there. 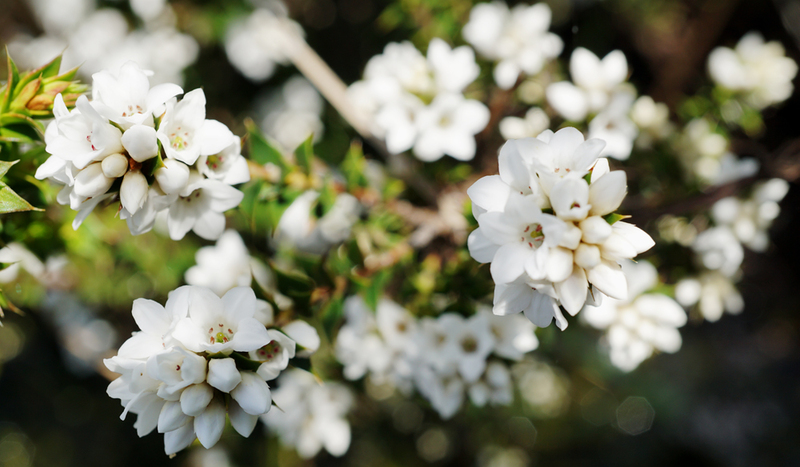 But don’t be mistaken into thinking this is TWIG water. NO NO! 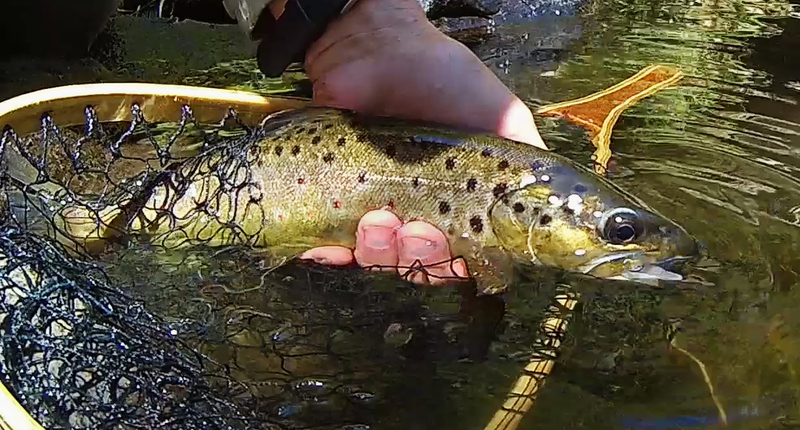 The dry stimmulator or caddis might only drift a meter or so & then…. SMASH! 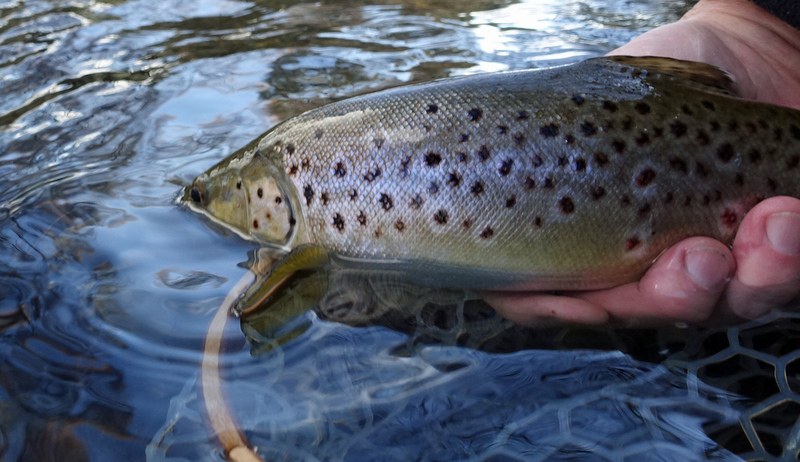 That three pound brown erupts from a few feet below the surface & grabs your fly, running you ragged around the shallow granite rocks! It’s about then that a deft net man comes in, & with the help of a good cameraman, records the capture, & its ‘high fives’ all round! 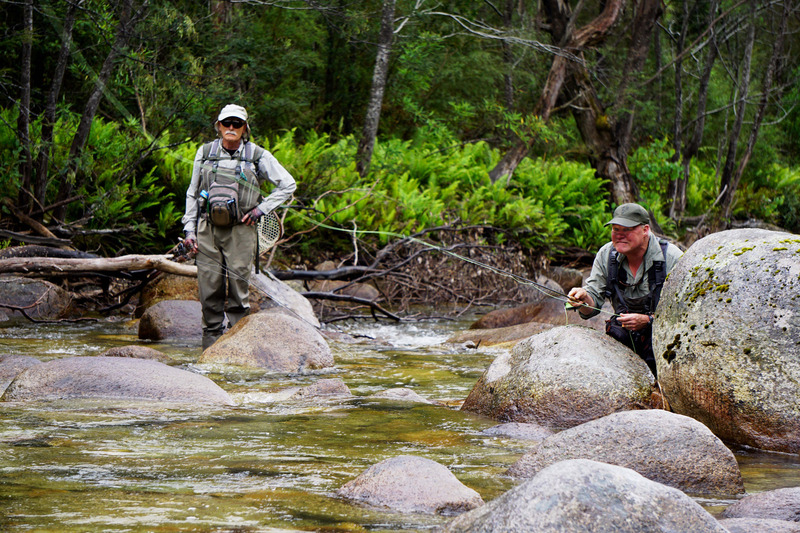 This small Snowy Mountain stream provided a great day of fly fishing, photography and companionship. How privileged are we to spend time together on this delightful piece of water! Whilst not easy to get to - the best bits never are - the 2 wgts (some even preferred fibreglass) light tippets & small dries, make for a congenial day out wandering this meandering stream! 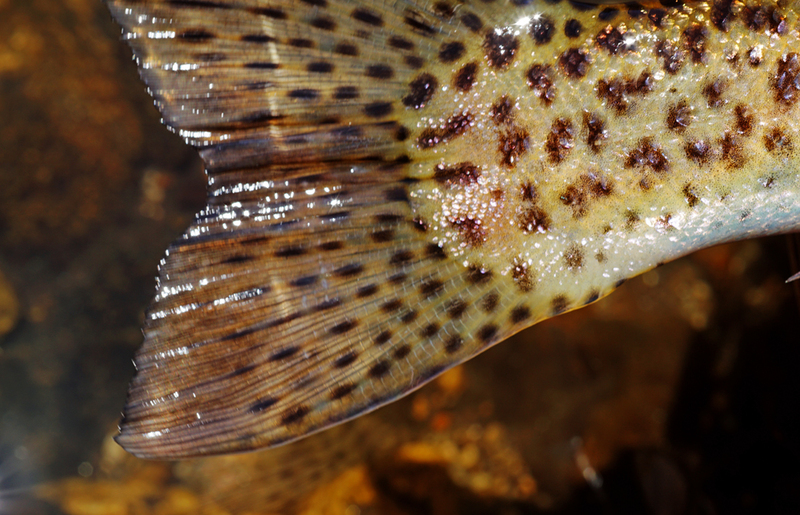 And add some of the most beautifully marked fish we’ve ever seen. Thanks Guys. 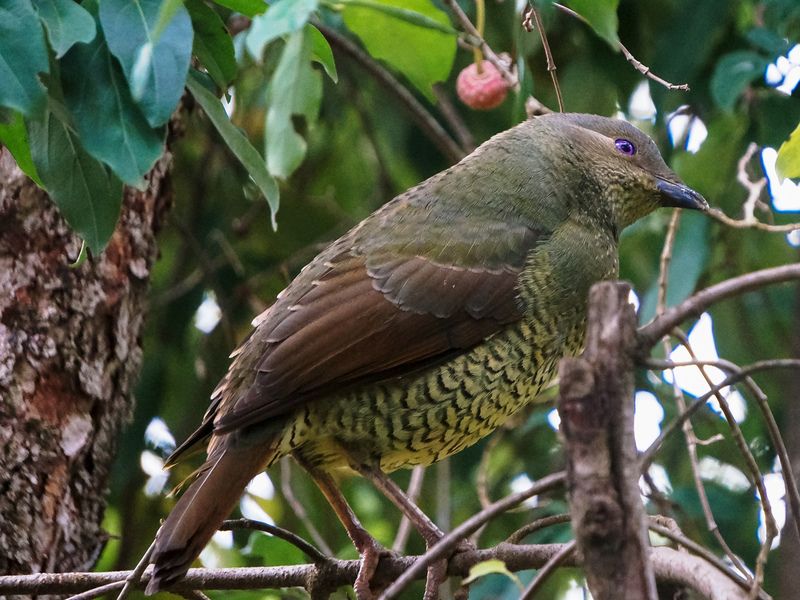 High summer sees the mature grubs drop from their willow leaf home and plop into the slow flowing low water pools of this famous NZ waterway. 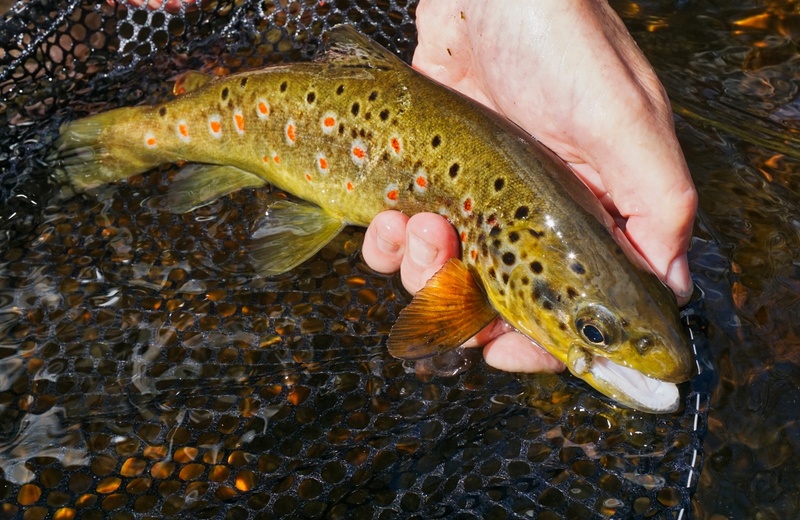 Resident brown trout are quick to respond to the feeding opportunity and can become single mindedly fixated on scooping up every last falling grub. From Khancoben poundage the Swampy Plains River runs for almost 20km through privately owned pasture land. 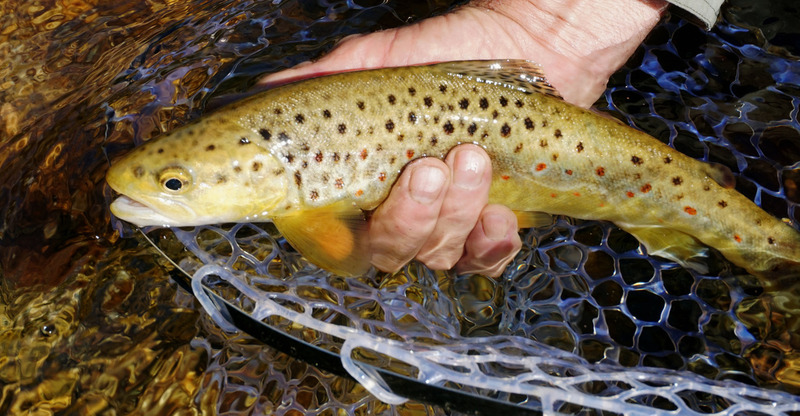 To access the fly fishing opportunities this stretch of the river offers a suitable floating raft is required. 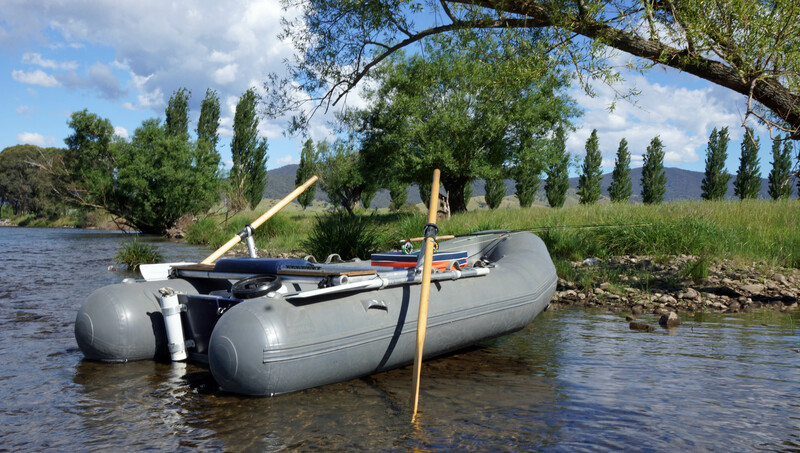 With this kind of transport every river bend with its gravel bars, split runs and the occasional backwater allows access to some great fly fishing. 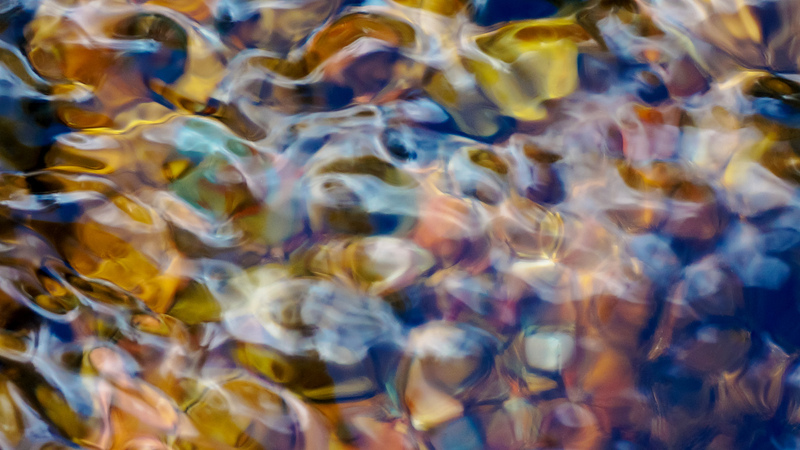 Several rivers border the remote Fiordland wilderness of New Zealand's South Island. 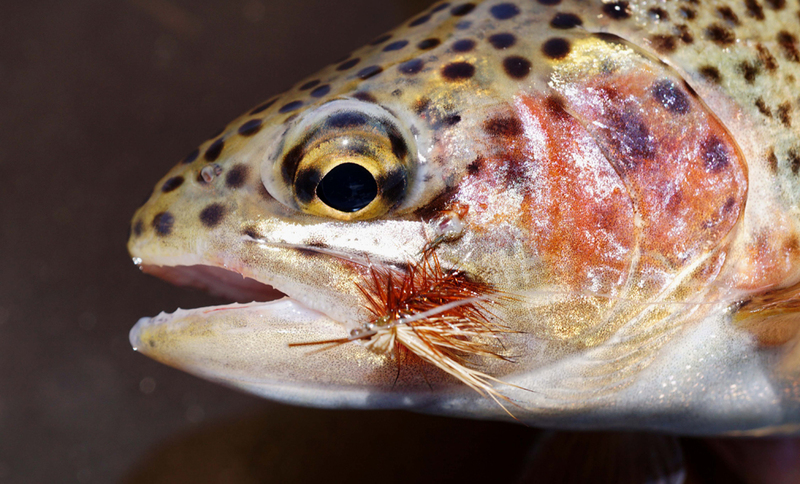 They provide a particular challenge for the visiting flyfisherman who must firstly determine which fly is in season. 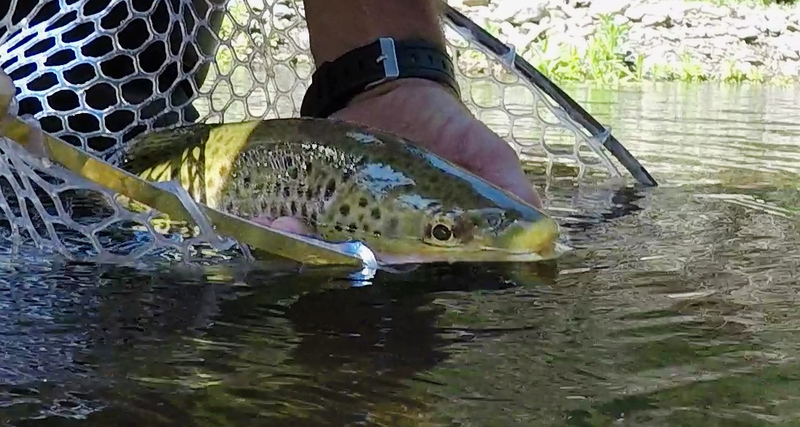 But the fit and feisty fish of these rivers don't give up easily! 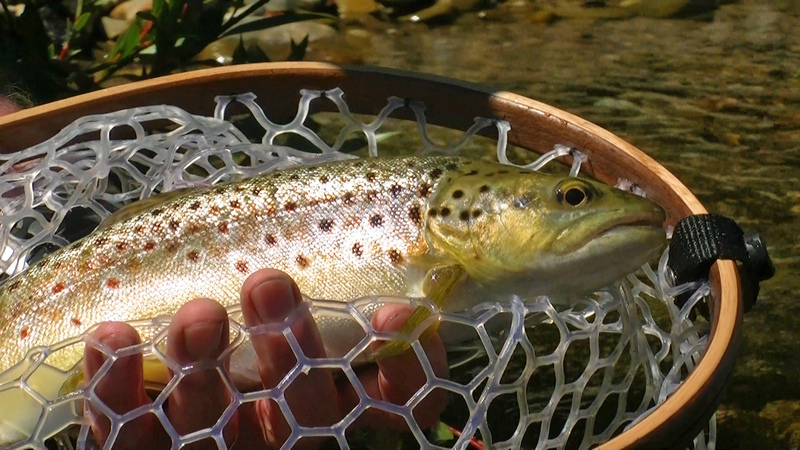 Once hooked, getting them successfully into a net can often prove to be a very demanding exercise. 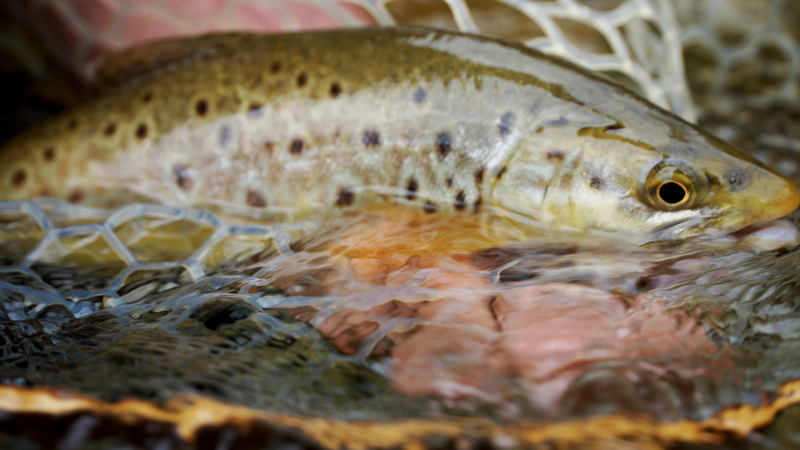 This can be a time of great fun or even greater frustration when a seemingly barren stream suddenly comes alive with rising trout as the sun begins to set in the late afternoon. 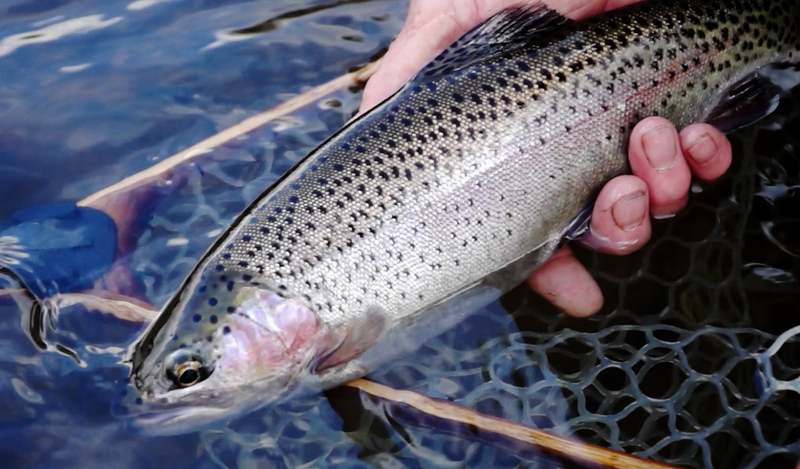 Quietly sipping brown trout feeding just below the surface were contrasted against the noisy splashes of rainbows which at times saw fish leaping well above the river surface. 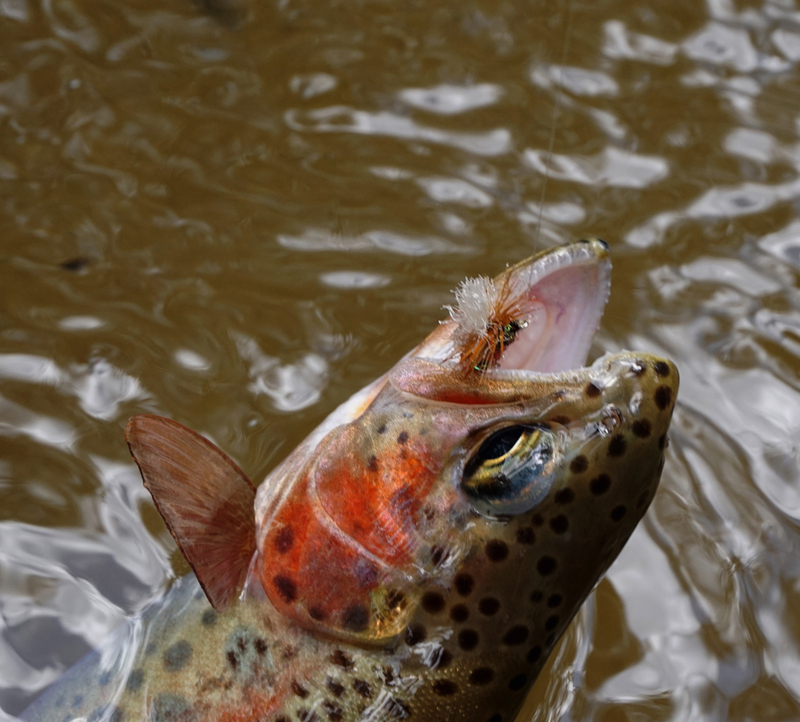 Our problem became - which fish to cast to and what fly to present? 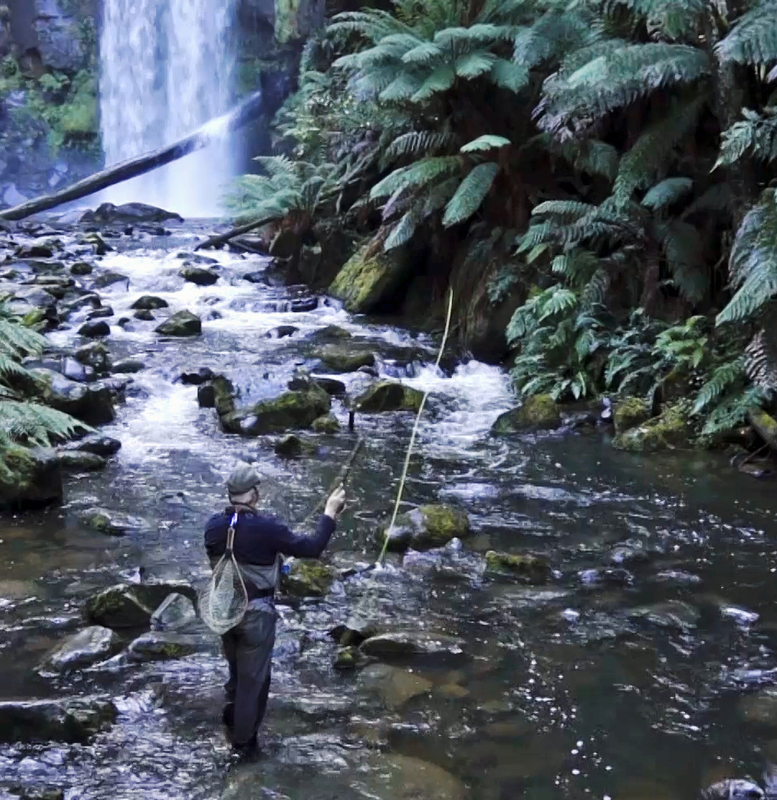 The activity continued well into the late evening which made fishing and filming equally challenging. 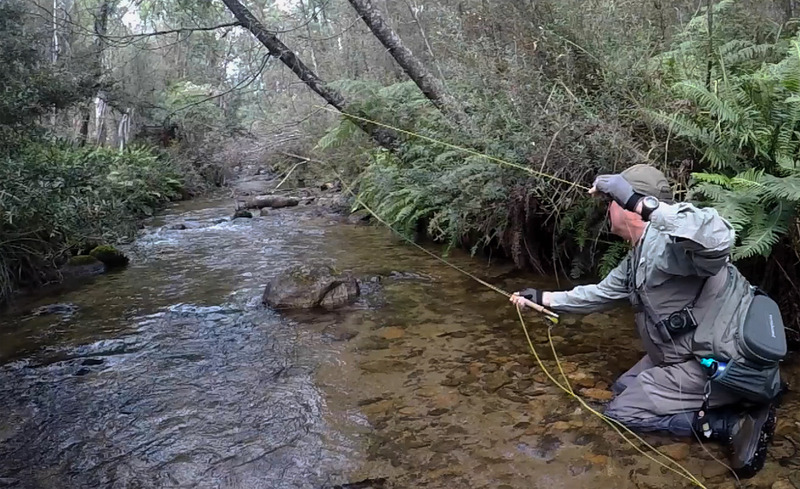 Just recently returned from chasing trout in the Central Highlands of Tasmania. 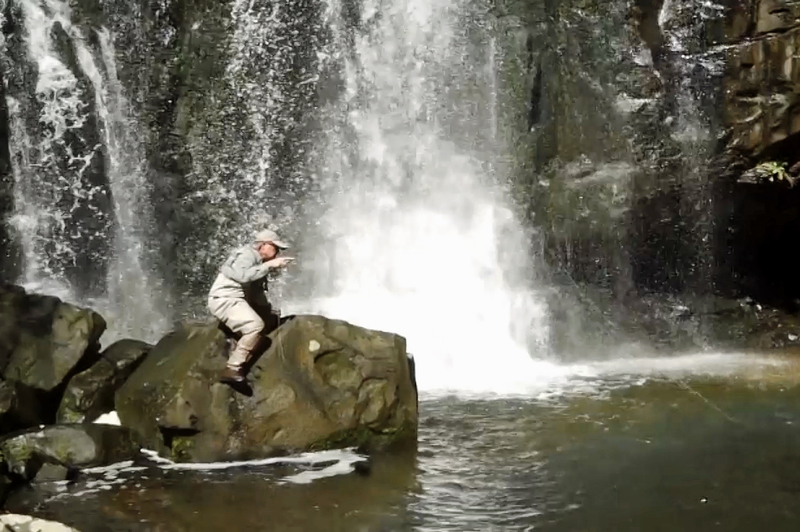 This is trout fishing at its purist. Walking the margins of these lakes in the predawn, standing back from the edge & scanning the shallows for the telltale swirl of a feeding trout, sometimes in only a few inches of water. 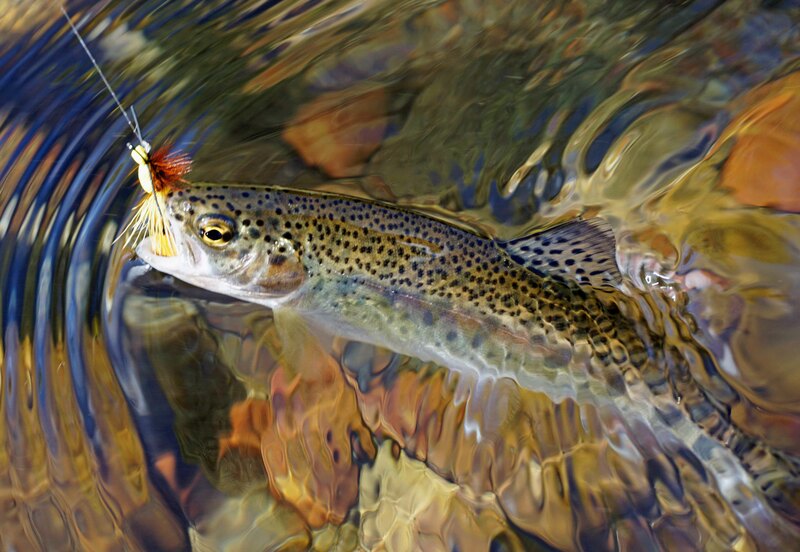 Once a working fish is sighted a low approach is mandatory and an "over the grass" cast is on the way to intercept a feeding fish. 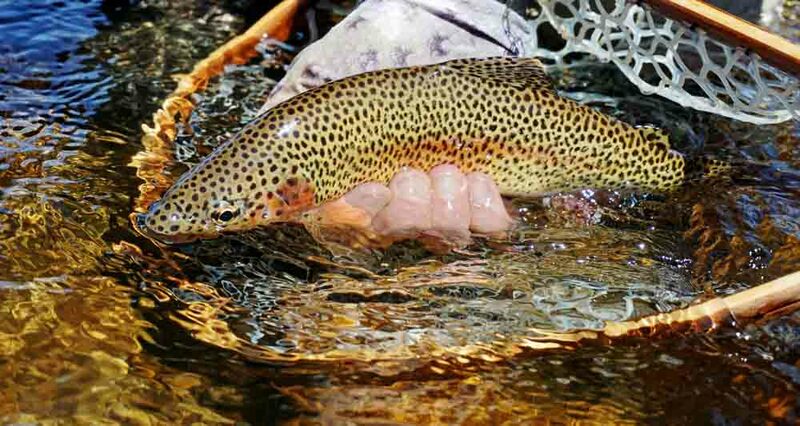 Stalking trout in this manner is very challenging to say the least, but it is great fun & very rewarding- the very pinnacle of our sport! 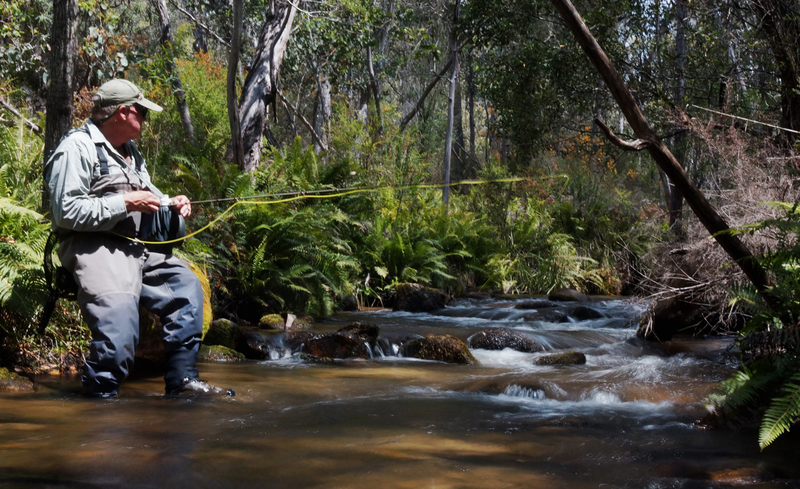 The trout season was almost over for the year when we heard from our local Proangler store that late season rain had produced an unusually healthy flow in Victoria's north eastern rivers. 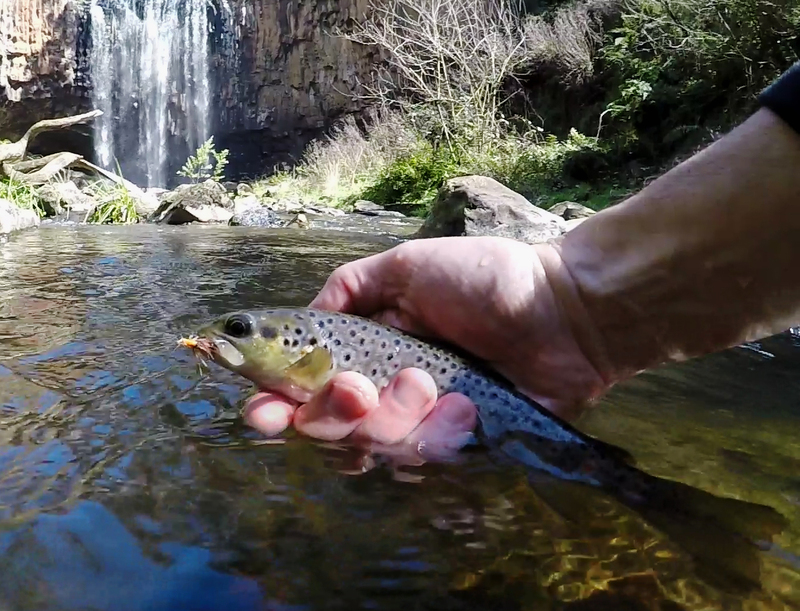 Small browns & rainbows were feeding actively throughout the upper reaches of the Ovens River. ... and 30 fish in 10 hours! 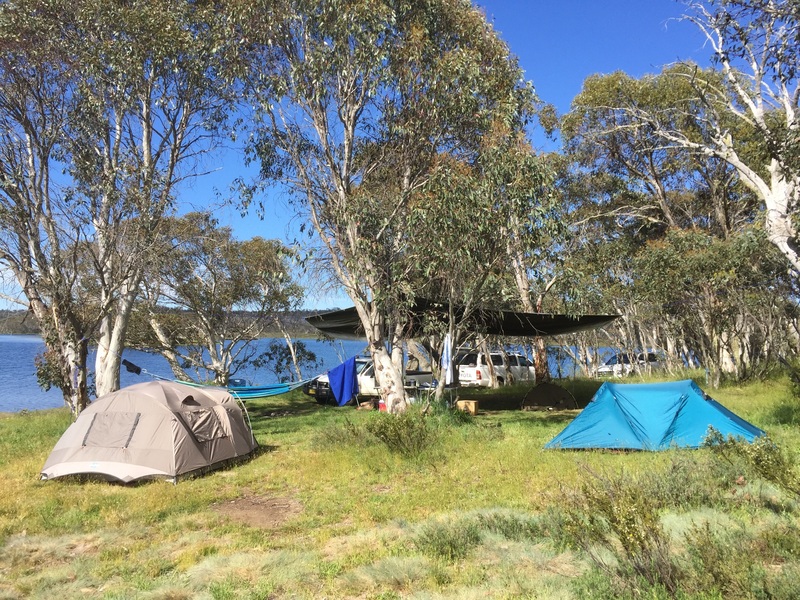 The south western slopes of Mount Kosciuszko provide the start to many small creeks and streams which tumble down steep slopes and pass through deep ravines before joining together to form the rivers which all eventually flow into the mighty Murray River. 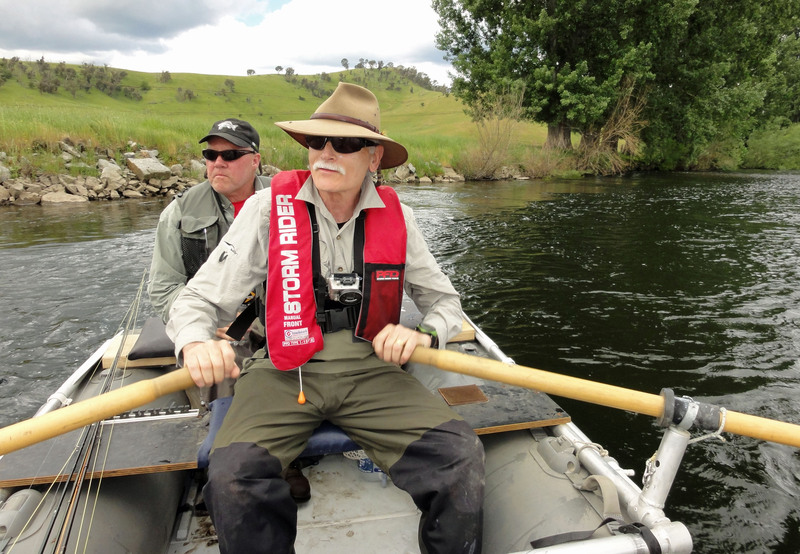 The Swampy Plains and Geehi Rivers are two such High Country rivers. This was the location of our recent filming trip. 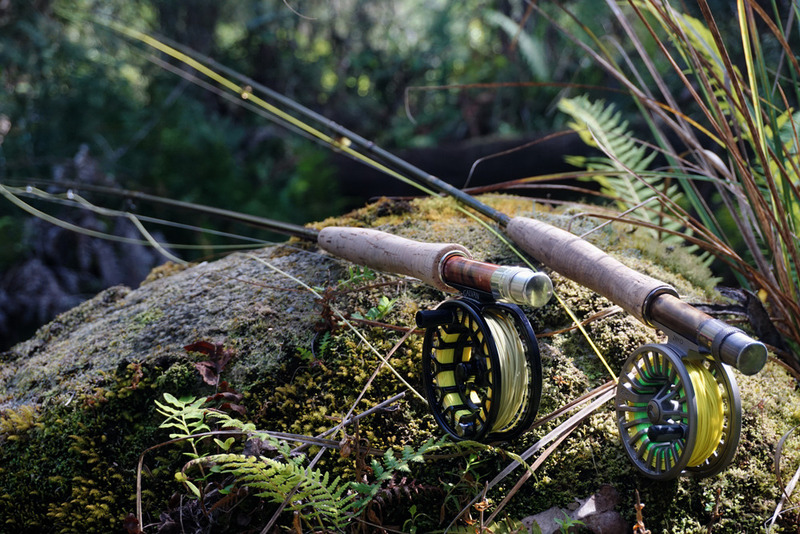 Light 2 weight Stalker rods and buoyant stimulator flies cast into the bubble line, were an ideal combination in these mountain streams. 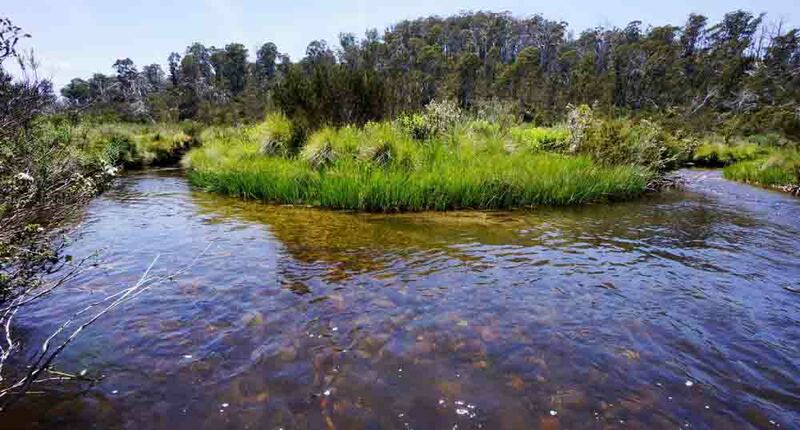 A small spring creek which bubbles up from the middle of a grassy cow paddock, makes its way a short distance across open pasture land before emptying into a major River. This was our fall back location when persistent rainy weather closed down the main rivers. Two million years ago the great tectonic plates of southeastern Australia began to bend and buckle. Major movements along southern Victorian fault lines created the structure we know today as the Otway Ranges. Rapid erosion accompanying the uplift formed deep steep sided valleys, with rapidly flowing creeks and many waterfalls, cascades and rapids. The weather was less than kind to us during this years New Zealand trip. 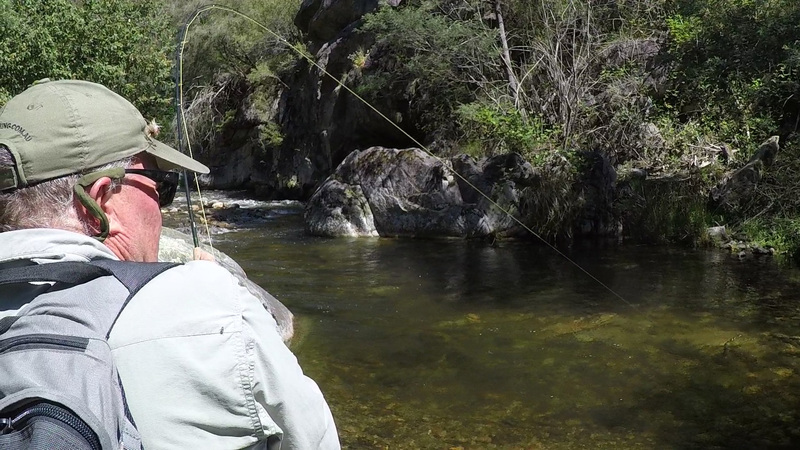 With the main rivers closed following heavy rain we were forced to venture much further afield for our Southland Rivers experience.